Dr. Graham’s Homes is quite unlike any other school. Proudly safeguarding the name of its founder and his ideals, this small island of hope and love looks with confidence to the challenges ahead, while never relinquishing the invisible threads tying it to Reverend Dr. John Anderson Graham’s great dream that led to its birth more than a hundred years ago. The Homes is committed to developing the strength of character, greater self-esteem and confidence of its students so that they may “walk this earth with dignity” whilst at the same time give of themselves for the benefit of society. Through its academic and extra-curricular activities, the School offers to all its students an opportunity for all round development. The staff and management of Dr. Graham’s Homes place great importance on the academic achievement of all its students. The teaching body has a wide range of academic qualifications and this is reflected in the curriculum on offer. 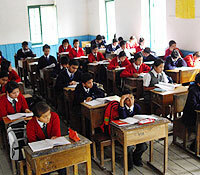 The School attracts students from all over India, Bangladesh, Thailand and Bhutan as well as other countries in Asia and Europe. There is a truly international feel about the place, which helps to develop a real pride in learning. Children start to learn from the moment they arrive in Lower Kindergarten through a combination of play and formal learning techniques. As they progress through the Junior School and into the Senior School, students are prepared for important certificate examinations, which provide a passport to future learning and employment. Formal learning is only part of the whole living experience offered at Dr. Graham’s Homes. It is the social learning which takes place in this community which leads us to believe that we offer a unique experience for children and young people who live, work and play here. The School has recently embarked on an ambitious development programme to further the curriculum by including informal education linked to the curriculum. The ‘Quest for Excellence’ programme has been introduced after formal school hours and offers a wide range of activities including vocational subjects like floriculture, drama and classical dance, martial arts and modern foreign languages including conversational Japanese. The Cottage-system of boarding is unique and quite unlike other residential schools. Cottage life is supervised by staff who assume the role of Cottage “aunties” and “uncles” and children live in a family atmosphere, where young and old assist in the daily tasks of cooking and cleaning, learning to live together in harmony in the community. This is a unique feature, which allows the students of Dr. Graham’s Homes to learn to look after themselves and to understand the importance of both self-reliance and interdependence in adult life. The Cottages are the basis of much competition with sports, drama, debating, elocution, singing and even gardening being closely fought in the annual contest for Best Cottage. The School has impressive sports facilities including a gymnasium, two basketball courts, a netball court and extensive playing fields for football, cricket, volleyball, throw ball and athletics. Also on offer are table tennis and badminton. The swimming pool complex is among the best in the region and Dr. Graham’s Homes has built a strong reputation for the quality of its swimming squads both locally and further afield. In other areas, the School boasts a renowned choir noted for their performances not only locally but also in Kolkata where they perform a series of concerts at high profile venues every December. The Choir undertook a tour of the UK in 2007 where they delighted audiences from the South of England to the North of Scotland with their vibrant singing, ranging from classical religious music to modern pop. For children of a musical bent, the School Band – with woodwind and brass sections – is an obvious choice. The Band was honoured to be invited to provide the principal marching accompaniment for the annual Independence Day Parade of schools in Kalimpong in 2009. The School also offers membership of NCC Cadets, Duke of Edinburgh Award Scheme, Scouts and Guides. There is certainly a lot going on here and our children are happy and contented in their very full lives. We believe that these activities, coupled with the formal curriculum, help in achieving the aim of providing our young people with the opportunity to become Successful Learners, Confident Individuals, Effective Contributors and ultimately Responsible Citizens.